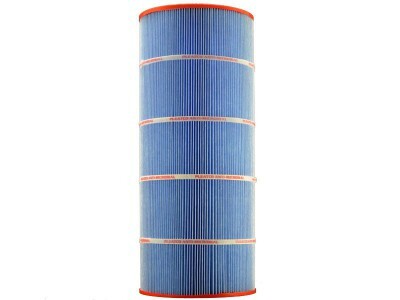 What Are Microban Pool Filter Cartridges? If you install a Microban cartridge in a filter, the same amount of chlorine or other sanitation chemicals will be required to keep your water clear. Microban material prevents the growth of those nasty slimy things on the cartridges themselves, but it does not prevent their spread elsewhere to parts like skimmers or water features. A Microban product’s reach does not extend its antimicrobial might to other surfaces or equipment. For example, if you have a Microban bath mat, you still need to clean the shower and tub, but the mat is fine. Why Do I Need Microban Cartridges? Microban Cartridges use a unique blue colored filter media. wash and store their cartridge inside for the winter are susceptible to a deep-seated mold that will colonize its fibers, making it brittle and useless. These gaps in activity are where bacteria and mold thrive and multiply by the millions. Unstable water chemistry is another likely factor for bacteria and mold growth in cartridges. If your pool filter system is working, you are chlorinating, and your water chemistry is in check, then bacteria should not gain a foothold to claim your cartridge for the Darkside. Bacteria and mold love damp places and dirty, stagnant water in which it can breed. A colony of bacteria or mold in your cartridges will not only hurt your cartridge, but also slow filtering capacity and increase the need for sanitation chemicals. Veteran pool owners will tell you that once you start chasing your chemistry levels you’re in for a long summer. So adding a Microban cartridge ticks one more headache chore off your to-do list. On an unprotected surface, some microbes can double in number every 20 minutes. And only when they’ve multiplied to hundreds of thousands, can they actually be seen by the naked eye. 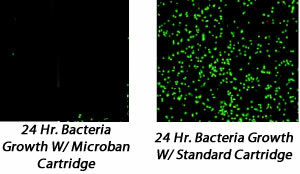 The images below show bacteria growth on a standard pool filter cartridge versus a pool filter cartridge infused with Microban® antimicrobial protection over a 24 hour period. What is in Microban and is it Safe? That is a tough question to answer due to Microban being an antimicrobial proprietary blend. The corporations who make and own the rights to these products do not wish to reveal their contents citing it as a trade secret. Because of this industry’s secrecy, some consumer advocate groups are arguing for more transparency, voicing concern that the Microban blend may contain harmful substances like triclosan. The molecule triclosan is a common additive in cleaning products like soaps and detergents that has been linked to some illnesses. But again there has been no confirmation either way on the contents of Microban so we will keep an eye on the developments for you. 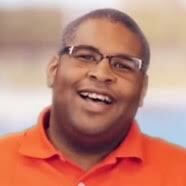 The main concern for triclosan stems from its use in Tupperware and toys which can expose it to small children directly, but the use of Microban in pool cartridges has not proven a concern. If you live in an area where winterizing your pool is necessary or your water chemistry is an unmanageable beast then Microban is the solution for you. Apart from those instances, a Microban cartirdge is a luxury, but not a necessity. Would this be safe to use with a salt water spa? I wonder if it would interfere with the salt water treatment. The Microban or regular cartridges are fine to use with saltwater pools. Neither interferes with the chlorination process.